How do you hold yours? Unless you’ve been hiding out in a cave recently, it won’t be news to you that the latest iPhone hit the shelves last week causing otherwise sane, if not slightly geeky, peeps to stand in line for hour upon hour to be one of the first to get their hands on one of these much hyped phones. But are these Apple fan boys and girls now feeling slightly disappointed with the latest addition to their Apple family? Well, I’d ask them but they seem to be having difficulty getting signal! You see, whilst this may have been the fastest selling Apple product ever released it also seems to be suffering from an awkward little problem of losing signal when certain parts of the outer casing are held at the same time. When Steve Jobs was emailed regarding the fault, his response was simple, “stop holding it that way”. Whilst a statement from the company explained “Gripping any mobile phone will result in some attenuation of its antenna performance, with certain places being worse than others depending on the placement of the antennas,” said the company in an official statement. “This is a fact of life for every wireless phone. If you ever experience this on your iPhone 4, avoid gripping it in the lower left corner in a way that covers both sides of the black strip in the metal band, or simply use one of many available cases.”. Whilst this was in no means an acceptable answer, given that the iPhone 4 is a phone at the end of the day and users should be able to use it as such without fear of holding it wrong! It did at least point to the fault being hardware based leading many people to call for the device to be recalled, including an announcement from the ‘fake’ Steve Jobs twitter account to that effect. However the real Steve Jobs’ latest email response suggests that the fault could actually be software based, stating “There is no reception issue. Stay tuned.”. Whatever the problem, given the reported 1.7 million sales in the last few days alone, I think it is only fair that Apple sorts it out and sorts it out fast! 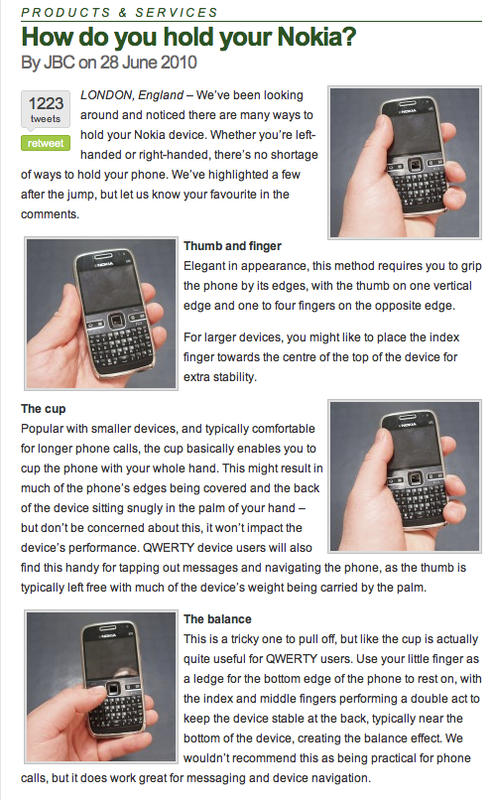 However it’s not all confusion and bad PR, Nokia have jumped aboard the “How do you hold yours?” debacle by releasing this press release. Whilst I’m a huge Apple fan, I have to say that having played with the iPhone 4 on the day of release, I really don’t get what all the fuss is about. Aesthetically it looks like one of those Sony Ericsson sliders that were about a good few years ago, and aside from the 5mp camera which is noticeably better than it’s predecessors, there really isn’t much of a reason to give up on your 3GS just yet. Especially at the sort of costs O2 and the like are quoting. Far from “This Changes Everything. 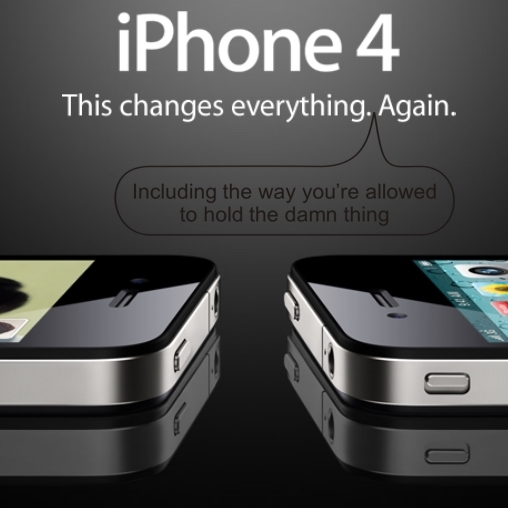 Again.” the only change I can see it making is the way you hold it, which is why i’ll be holding onto my full-signalled 3GS for a good while longer! like it, never thought i would here a company actually say there is a correct way to hold a phone-most people just hold it-so well done you for pointing out its first of maybe many complaints-good luck apple!!!! Keep sending the blogs, you have a real knack for it, informative and funny to boot! !